TWO of the biggest hitters in Northern Ireland’s aviation sector have been congratulated by Down District Chairperson Councillor Maria McCarthy for their community commitment and desire to help the region’s tourism sector to soar. This week she welcomed on board B/E Aerospace, the Kilkeel-based manufacturer of seating and interior products for the global commercial airline industry, as headline sponsor of the 2013 Festival of Flight on Saturday 10 August, and introduced Belfast International Airport as an exciting newcomer to the event’s already impressive list of private sector sponsors. Councillor McCarthy said: “We are delighted to have major names in the aviation sector share our vision for what is now firmly established as one of Ireland’s most exciting and best attended Air Shows. Organised by Down District Council, the B/E Aerospace Festival of Flight on Saturday 10 August boasts over 30 events, many with FREE admission. 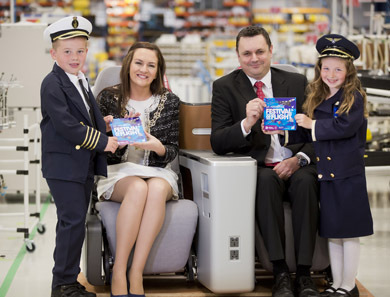 B/E Aerospace’s Neil Cairns, Vice President & Managing Director and Chairman of Down District Council, Councillor Maria McCarthy, launching the festival programme with Jake Cousins and Julia Graham, (both 6) from Kilkeel. The annual Festival of Flight attracts more than 100,000 visitors to enjoy a day of spectacular aerobatical displays over the natural amphitheatre of Dundrum Bay, enhanced with an extended programme of activity and attractions at ground level and this year promises to have that ‘five star quality’ with the recent announcements of the Red Arrows and the Vulcan which should see the visitors numbers climb to over 100,000. This will be the third year in succession that B/E Aerospace has given its financial backing to a programme which Neil Cairns, Vice President and Managing Director of the B/E Aerospace plant at Kilkeel, describes as ‘a highpoint – in every sense of the word’ of the company’s extensive community engagement programme. Mr Cairns said: “Ours is a serious business, but we never forget that our commercial success in the design and manufacture of seating and interior products for the world’s airline industry is borne out of our passion for aviation. The Festival of Flight gives us a wonderful opportunity to share that passion with others and we are delighted to continue this much valued association. “As one of the area’s largest private sector companies, employing more than 750 people, we have a huge stake in the local community and we know that many of our own staff and their families will be amongst the audience with their eyes on the skies, waiting for the thrill of the Red Arrows soaring over the horizon. “However, the Festival of Flight is not only about providing an amazing event for local people: it is also a significant contributor to the local economy. Belfast International Airport will be supporting the Festival which is described as ‘a landmark in the tourism calendar’ as a key element of its fiftieth birthday celebrations. Deborah Harris, Public Relations Manger added: “We are also celebrating a landmark of our own this year, for the airport is fifty years old in 2013: that is fifty years of serving the community; fifty years of connecting Northern Ireland and fifty years of memorable flying experiences. “This will be another of those memorable experiences. This year’s Festival is going to be spectacular with some amazing aircraft flying past the spectacular scenery of Dundrum Bay. 2013 represents a milestone for the airport that started life as a civil airport in October 1963. On that occasion HRH Queen Elizabeth. The Queen Mother officially opened the new terminal on the extensive site at Aldergrove. Throughout its fifty year history, Aldergrove – now Belfast International Airport – has played a central role in the economic and social life of Northern Ireland. With over 4,000 jobs and 250 businesses on sire, we contribute in the region of £400million each year to the local economy. From quite humble beginnings we now operate to around eighty domestic and international destinations with over 200 flights a day on average. “2013 will be an occasion for us to celebrate a very special birthday and we want to thank all who enjoy the Festival for their business – and we hope that everyone has a fantastic day at this year’s Festival of Flight. “The mammoth Avro Vulcan XH558 which will be one of the star attractions at the 2013 Festival is expected to ‘overnight’ at Belfast International Airport after swooping in to delight the crowds on Saturday 10 August”. The Northern Ireland Tourist Board are also backing this major event and Eddie Rowan, Events Manager commented: “We are delighted to once again support the Festival of Flight in Newcastle. With a large numbers of spectators expected to attend, events such as the Festival of Flight bring domestic and international spectators to spend time in Northern Ireland. The financial benefit that these visitors bring is important for stimulating growth and delivering economic value to so many differing sectors of the local economy. Information about all the events in the 2013 Festival of Flight will be available shortly at www.downdc.gov.uk, www.facebook.com/DownFestivals, and twitter@DownFestival. Contact ourFestival Office on 028 4372 2222.